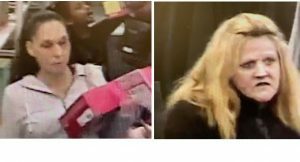 Suffolk County Crime Stoppers and Suffolk County Police Fourth Precinct Crime Section officers are seeking the public’s help to identify and locate two women who stole merchandise from a Commack store in December 2018. The women stole miscellaneous items from Kohl’s, located at 45 Crooked Hill Road, on December 24, at approximately 4:30 p.m. The merchandise was valued at more than $600.